This is from notes I made not long after the hike, around 1984. It was an official club hike billed as follows: “Mt. LeConte via Bearpen Hollow, Return by Big Duck Hawk Ridge.” But by the time we got to the turnoff for Big Duck Hawk, only six in the group wanted to descend the ridge rather than following Alum Cave Trail all the way down. I can’t blame the ones who stayed on the trail. It had poured rain on us as we struggled up Bearpen Hollow. When we finally got up to the Lodge, we all baked in the warmth of the wood-burning stove until our clothes steamed. We wrung out our socks and hung them up to dry. 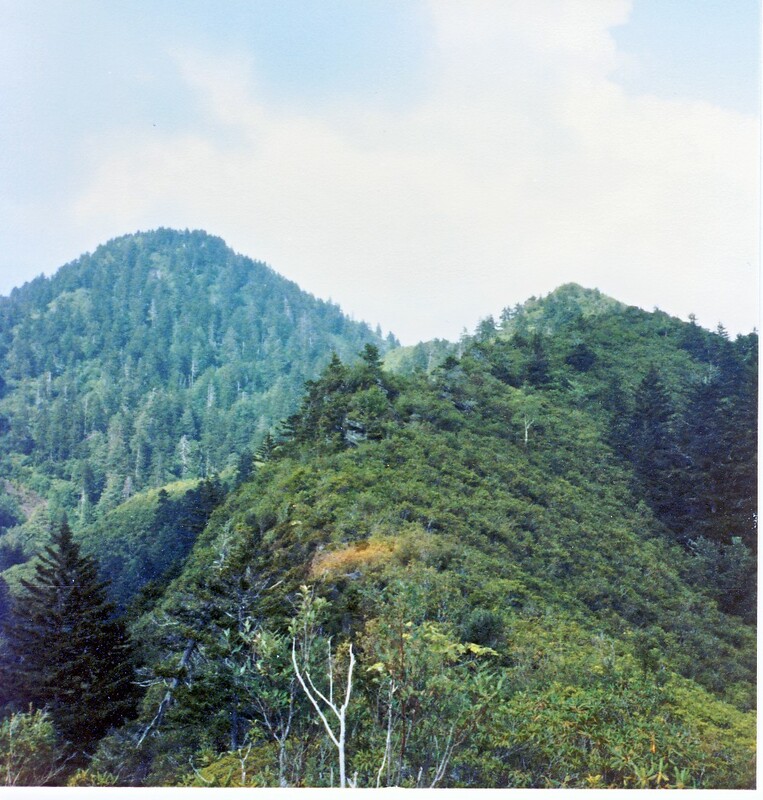 I went over to the glass case in the corner that contains a 3-D model of LeConte, and I admired the steep route we’d come up. In the dim light I squinted at the pictures of notable personages of LeConte. The sun began to come out after lunch as we marched down Alum Cave. The trail felt so comfortable, so easy to stride along after a morning of climbing over blowdowns, crawling under rhodo, and jumping off boulders, all in a needling silver rain. And I must say that when Brian Worley, our leader, stopped at an inconspicuous clump of trees and said, “This is the way down,” it did appear unlikely. But I was intrigued. I and four others volunteered to go that way. 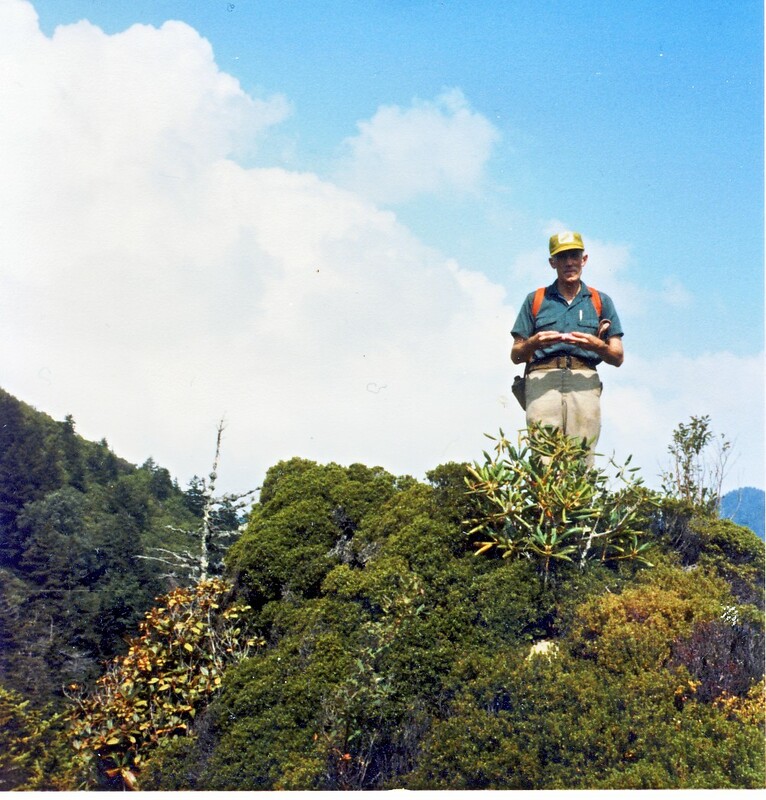 When the last of the multicolored string of hikers had tromped by, we stepped off the edge of the trail and found ourselves immediately plunging into another world, steep and overroofed with rhododendron. We skittered downward almost out of control, hanging onto branches, wrapping ourselves around treetrunks. A big bulk of vine-covered rock floated past like a freighter on our left. Down and down, our feet slipping in the rich chocolatey dirt. Overhead, everything green, the sun almost blocked out by the thick waxy leaves. We rolled, slid, and otherwise progressed down this slope until it narrowed into a ridgecrest. Here the manway leveled off. We found ourselves walking upright, with no need to hang onto anything, through a pleasant wood with the ridge falling away on both sides. This lasted only a few minutes before the ridge suddenly humped up and all the vegetation gave out. All at once we were climbing up a rock staircase with a dropoff on each side. We came out into the brilliant sun. When I found myself stepping up that staircase into nothing but sharp empty air, I felt apprehensive at first, but that gave way to a peculiar sense of exhilaration. At the top of the staircase the manway leveled off again and took us through beds of blooming sand myrtle. The tiny pink and white flowers bordered the path on both sides. Overhead, an enormous bowl of sunny sky. On all sides, green furry mountains with their pelts drying out in the sun. Just to the east of us, we could see Little Duck Hawk, the companion ridge that was even narrower than Big Duck Hawk. Rob, who was next in line behind me, said, “Look! You can see the hole through Little Duck Hawk!” It took me a minute, but when I stood in the right place and looked in the right direction, I could make out the peculiar pothole that wind and rain had drilled through the delicate rock fin. “I love it up here! I love places like this!” Rob said. Ahead of us, Brian Worley was jaunting along, happily leading the way. A childish joy had engulfed us. The six of us walked rapidly through the warm afternoon air. The ridgetop unrolled under our feet as if it came off a spool. The manway began to descend over tiled rocks that looked like layered pastries. We scuttled crabwise down these. As we progressed, I noticed that Rob and Bill Neal had fallen behind. But Bill knew the way, so I didn’t worry. After all, wasn’t it a simple matter of following the ridge all the way down? We left behind the rock outcrops to enter some low, dense, rhododendron. Soon we were crawling on our hands and knees through a jungle that would have been better suited to beings two feet high. “Are you sure this is the right way?” someone asked Brian. He laughed. “Right way? Why, you’re certainly a stickler for detail,” he said. Someone else noted that Rob and Bill were not to be seen behind us any more. It was decided to press on, since Bill had probably stuck to the correct route, while we had gone astray. So we kept working our way along close to the ground. Going downhill steeply, you could either crawl headfirst, which gives the sensation of diving through the damp green depths, or you could go feetfirst, propping yourself up on your hands. Either way, you got the soft dirt under your fingernails and twigs down the back of your neck. Before long we came to the head of a draw that formed an open little alley through the jungle. Straightening our bodies in the ample headroom, we walked rapidly down the dry streambed. We were going very fast, and I’m not sure exactly why, except out of sheer momentum. “Where are we going?” we asked Brian. “Never fear!” he said. Sure enough, in a few minutes we burst out onto the lower end of the Alum Cave Trail, a mile up the road from where we were supposed to come out. A family strolling up the trail was startled to see four mud-covered beings abruptly emerge from the thickets. And then we were out through the parking lot and going down along the road’s grassy shoulder to where our journey had begun. Sure enough, Rob and Bill had found their way back to the road—along the way we were all supposed to take. Note: Since writing the above, I have learned that the Park Service has banned hiking on both Little Duck Hawk and Big Duck Hawk Ridges. I believe this is due to both the hazardous nature of the travel (more in the case of Little than Big) and for protection of peregrine nesting places. Posted by Jenny in history, memoir, nature. Simon Willard is my one “illustrious ancestor.” (Some of the others were Irish sheep stealers. There was a bag of wool on the family coat of arms.) I plan to write a series of posts about him on this blog. Here is the first. He established himself in Cambridge, and bought a property of whom the neighbors were : “Dollard Davis, one house-lot of half a rood, more or less, Water Street, north-west; John Bridge, south-west; William Andrews, north-east; William Westwood, east.” Anyone who is familiar with current property values in Cambridge, Mass., will appreciate the worth of that property. 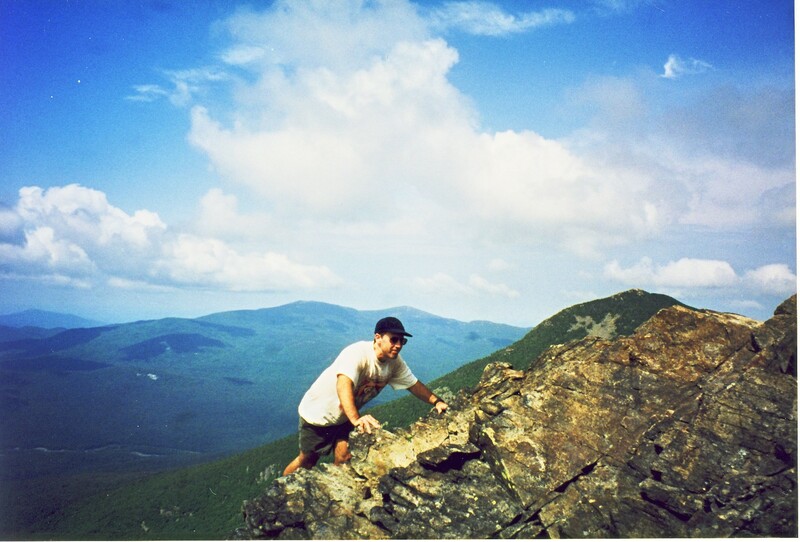 Posted by Jenny in bushwhacking, hiking, nature, White Mountains. So what we did was take that trail to the 2800 foot elevation point and then jaunted off through the woods toward the giant talus slide. Up to about 3400 feet, we moved easily through open mossy woods. Then we started running into smooth, steep ledges alternating with bristly scrub evergreens. (Diametrically opposed textures: babyface smooth rock and picky spruce needles that stabbed your eyes or went up your nostrils.) Our pace slowed down dramatically. Finally we got right out into the middle of the talus slope just below 4000 feet. It was very rubbly and unstable. It was a situation of trying to find “the angle of repose.” We went straight up and just below the summit did a nifty section of Class 3 scrambling. There was one other person on the summit. 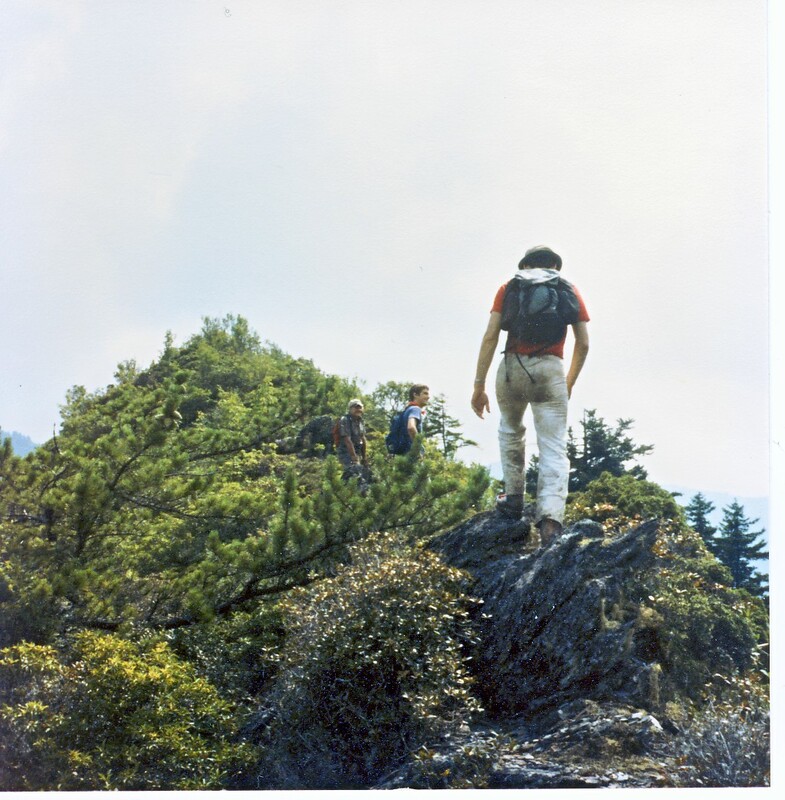 We did not try to explain to this person what we had just done, and he did not seem to notice that we had come up directly from below instead of across on the trail. We hadn’t taken any pictures on the way up, but after we got up there, Bob downclimbed a short bit so that he could do a “conquering the summit” type photo. He looks suitably grim and determined, I think. We then trudged our way over to the summit of Liberty. It was a hot, sweaty, buggy experience. I went through 2 quarts of water and Bob went through 3. We took the chance of refilling our water bottles at Liberty Springs, though we didn’t have iodine or a water filter. Nothing terrible happened to us, so the water must have been all right. We got back down to the car uneventfully.